By default, AKS clusters use kubenet, and a virtual network and subnet are created for you. With kubenet, nodes get an IP address from a virtual network subnet. Network address translation (NAT) is then configured on the nodes, and pods receive an IP address "hidden" behind the node IP. This approach reduces the number of IP addresses that you need to reserve in your network space for pods to use. With Azure Container Networking Interface (CNI), every pod gets an IP address from the subnet and can be accessed directly. These IP addresses must be unique across your network space, and must be planned in advance. Each node has a configuration parameter for the maximum number of pods that it supports. The equivalent number of IP addresses per node are then reserved up front for that node. This approach requires more planning, and often leads to IP address exhaustion or the need to rebuild clusters in a larger subnet as your application demands grow. This article shows you how to use Azure CNI networking to create and use a virtual network subnet for an AKS cluster. For more information on network options and considerations, see Network concepts for Kubernetes and AKS. The virtual network for the AKS cluster must allow outbound internet connectivity. Don't create more than one AKS cluster in the same subnet. Clusters configured with Azure CNI networking require additional planning. The size of your virtual network and its subnet must accommodate the number of pods you plan to run and the number of nodes for the cluster. IP addresses for the pods and the cluster's nodes are assigned from the specified subnet within the virtual network. Each node is configured with a primary IP address. By default, 30 additional IP addresses are pre-configured by Azure CNI that are assigned to pods scheduled on the node. When you scale out your cluster, each node is similarly configured with IP addresses from the subnet. You can also view the maximum pods per node. The number of IP addresses required should include considerations for upgrade and scaling operations. If you set the IP address range to only support a fixed number of nodes, you cannot upgrade or scale your cluster. When you upgrade your AKS cluster, a new node is deployed into the cluster. Services and workloads begin to run on the new node, and an older node is removed from the cluster. This rolling upgrade process requires a minimum of one additional block of IP addresses to be available. Your node count is then n + 1. When you scale an AKS cluster, a new node is deployed into the cluster. Services and workloads begin to run on the new node. Your IP address range needs to take into considerations how you may want to scale up the number of nodes and pods your cluster can support. One additional node for upgrade operations should also be included. Your node count is then n + number-of-additional-scaled-nodes-you-anticipate + 1. If you expect your nodes to run the maximum number of pods, and regularly destroy and deploy pods, you should also factor in some additional IP addresses per node. These additional IP addresses take into consideration it may take a few seconds for a service to be deleted and the IP address released for a new service to be deployed and acquire the address. The IP address plan for an AKS cluster consists of a virtual network, at least one subnet for nodes and pods, and a Kubernetes service address range. Virtual network The Azure virtual network can be as large as /8, but is limited to 65,536 configured IP addresses. Subnet Must be large enough to accommodate the nodes, pods, and all Kubernetes and Azure resources that might be provisioned in your cluster. For example, if you deploy an internal Azure Load Balancer, its front-end IPs are allocated from the cluster subnet, not public IPs. The subnet size should also take into account upgrade operations or future scaling needs. If you don't specify a maximum number of pods per node when you create your cluster, the maximum number of pods per node is set to 30. The minimum number of IP addresses required is based on that value. If you calculate your minimum IP address requirements on a different maximum value, see how to configure the maximum number of pods per node to set this value when you deploy your cluster. Kubernetes service address range This range should not be used by any network element on or connected to this virtual network. Service address CIDR must be smaller than /12. Kubernetes DNS service IP address IP address within the Kubernetes service address range that will be used by cluster service discovery (kube-dns). Don't use the first IP address in your address range, such as .1. The first address in your subnet range is used for the kubernetes.default.svc.cluster.local address. Docker bridge address IP address (in CIDR notation) used as the Docker bridge IP address on nodes. Default of 172.17.0.1/16. The maximum number of pods per node in an AKS cluster is 110. The default maximum number of pods per node varies between kubenet and Azure CNI networking, and the method of cluster deployment. You're able to configure the maximum number of pods per node only at cluster deployment time. If you deploy with the Azure CLI or with a Resource Manager template, you can set the maximum pods per node value as high as 110. Azure CLI: Specify the --max-pods argument when you deploy a cluster with the az aks create command. The maximum value is 110. Resource Manager template: Specify the maxPods property in the ManagedClusterAgentPoolProfile object when you deploy a cluster with a Resource Manager template. The maximum value is 110. 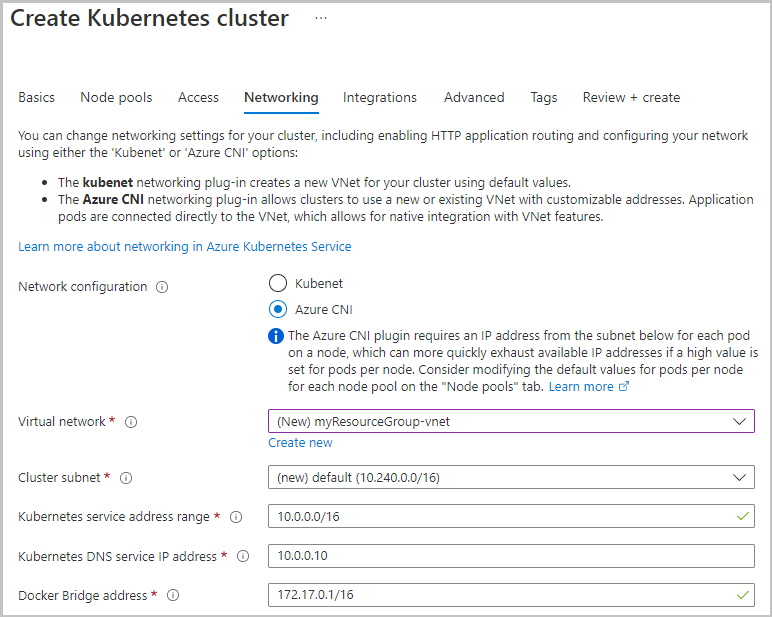 Azure portal: You can't change the maximum number of pods per node when you deploy a cluster with the Azure portal. Azure CNI networking clusters are limited to 30 pods per node when you deploy using the Azure portal. You can't change the maximum pods per node on an existing AKS cluster. You can adjust the number only when you initially deploy the cluster. Virtual network: The virtual network into which you want to deploy the Kubernetes cluster. If you want to create a new virtual network for your cluster, select Create new and follow the steps in the Create virtual network section. For information about the limits and quotas for an Azure virtual network, see Azure subscription and service limits, quotas, and constraints. Subnet: The subnet within the virtual network where you want to deploy the cluster. If you want to create a new subnet in the virtual network for your cluster, select Create new and follow the steps in the Create subnet section. For hybrid connectivity, the address range shouldn't overlap with any other virtual networks in your environment. Although it's technically possible to specify a service address range within the same virtual network as your cluster, doing so is not recommended. Unpredictable behavior can result if overlapping IP ranges are used. For more information, see the FAQ section of this article. For more information on Kubernetes services, see Services in the Kubernetes documentation. Kubernetes DNS service IP address: The IP address for the cluster's DNS service. This address must be within the Kubernetes service address range. Don't use the first IP address in your address range, such as .1. The first address in your subnet range is used for the kubernetes.default.svc.cluster.local address. Docker Bridge address: The IP address and netmask to assign to the Docker bridge. The Docker Bridge lets AKS nodes communicate with the underlying management platform. This IP address must not be within the virtual network IP address range of your cluster, and shouldn't overlap with other address ranges in use on your network. When you create an AKS cluster with the Azure CLI, you can also configure Azure CNI networking. Use the following commands to create a new AKS cluster with Azure CNI networking enabled. The following questions and answers apply to the Azure CNI networking configuration. Can I deploy VMs in my cluster subnet? No. Deploying VMs in the subnet used by your Kubernetes cluster is not supported. VMs may be deployed in the same virtual network, but in a different subnet. Can I configure per-pod network policies? Kubernetes network policy is currently available as a preview feature in AKS. To get started, see Secure traffic between pods by using network policies in AKS. Is the maximum number of pods deployable to a node configurable? Yes, when you deploy a cluster with the Azure CLI or a Resource Manager template. See Maximum pods per node. You can't change the maximum number of pods per node on an existing cluster. How do I configure additional properties for the subnet that I created during AKS cluster creation? For example, service endpoints. The complete list of properties for the virtual network and subnets that you create during AKS cluster creation can be configured in the standard virtual network configuration page in the Azure portal. Can I use a different subnet within my cluster virtual network for the Kubernetes service address range? It's not recommended, but this configuration is possible. The service address range is a set of virtual IPs (VIPs) that Kubernetes assigns to internal services in your cluster. Azure Networking has no visibility into the service IP range of the Kubernetes cluster. Because of the lack of visibility into the cluster's service address range, it's possible to later create a new subnet in the cluster virtual network that overlaps with the service address range. If such an overlap occurs, Kubernetes could assign a service an IP that's already in use by another resource in the subnet, causing unpredictable behavior or failures. By ensuring you use an address range outside the cluster's virtual network, you can avoid this overlap risk. Azure Kubernetes Service Engine (AKS Engine) is an open-source project that generates Azure Resource Manager templates you can use for deploying Kubernetes clusters on Azure. Kubernetes clusters created with AKS Engine support both the kubenet and Azure CNI plugins. As such, both networking scenarios are supported by AKS Engine.